Who is rich if not them? The fact that Fitzgibbon used the short-hand way of saying ‘250,000’ is significant as it makes his comment look even more preposterous. A quarter of a million dollars. A million dollars over four years before tax. In the same sentence as the word ‘struggling’. What planet is Joel Fitzgibbon on? I can probably take a guess at the answer to this question. Fitzgibbons is on planet ‘get me re-elected’ and will say and do anything he feels necessary so not to offend or concern anyone in his electorate, including the very rich. This is a cowardly way to campaign. Particularly since he represents the traditionally safe Labor seat of Hunter. Fitzgibbon has already proven with his behaviour in the Rudd camp that he is undeserving of membership of the Labor party, let alone a seat. But pandering to the wealthy, at the expense of tax revenue that could be used to level the playing field for the very poor, is totally unacceptable for a Labor MP. In 1996, when Howard was elected, the top tax rate kicked in at $50,000 and by the time he left office it had risen to $150,000. Obviously you couldn’t be a high-income earner if you weren’t in the top tax bracket. He used the same approach to welfare support, introducing a range of benefits that flowed to middle- and high-income earners. Again, how could families feel they were doing very well by community standards when the community saw them as being in need of financial support? By giving wealthy people middle class welfare, such as super tax breaks, the baby bonus and the first-home-owner grant, all Howard achieved was to imbed a sense of entitlement in the very rich. This sense of entitlement remains today. In my view it’s time to turn the tap off. It’s time to remind people who earn a crap load of money that they have absolutely no right to receive welfare of any kind. They should also be reminded that they are not entitled to resent the high rates of tax they pay since the only reason they are rich in the first place is because of the opportunities afforded them by living in a well run society, which was built on the back of a fair government taxation system. Elizabeth Warren explains this best. Let’s look closer at an income of $250,000. If Fitzgibbon is correct, and there really are people in Western Sydney earning this much money and struggling, then what has gone wrong in their lives to cause this situation? What sort of consuming addiction and predilection to spend outside their means must a family have developed to feel stretched on this income? Breaking this down, let’s look at an example where a wife earns $150,000 as a sales manager, and her husband earns $100,000 as a plumber. Their after-tax weekly income is $3,492. Anyone who thinks their daily necessities of life cannot be met with $3,492 a week needs to see a financial counsellor. I don’t even care if the family has five children. Food, clothes, bills and a mortgage in Western Sydney are not so expensive that $250,000 is a modest income. Obviously if you spend all of this income, you will feel broke. Is this what Fitzgibbon means? That these people spend too much and that’s why they’re struggling? Look at this house for sale in Cecil Hills. 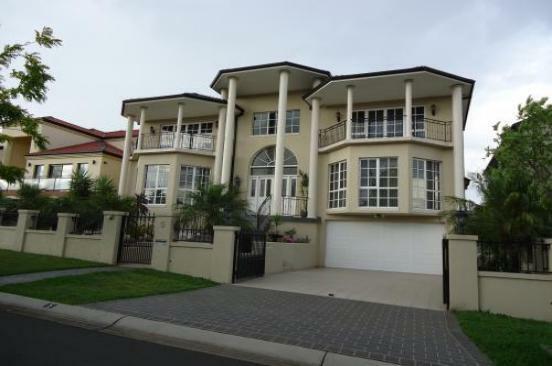 The real estate agent is offering buyers to ‘Live like a king on 943 m2 block of land!’ This mansion has five bedrooms and is on the market for $1,450,000. Assuming the buyer had a 10% deposit, their weekly mortgage payment on this house fit for a king would be $1,886. So our $250,000 family could afford this mortgage if they didn’t mind ‘stretching’ themselves, with $1,606 left each week for life’s necessities. (And also things they want, but don’t need, like take away dinners, holidays and designer clothes, new cars and electronic equipment). When you compare this family living like a king, to a couple who works full time on a minimum wage, who take home $558 each a week, it’s hard to imagine how their lifestyles could be further apart. And it’s also impossible to imagine that the wealthy family is struggling and in need of government tax subsidies on their superannuation. To put it simply, a family earning $250,000 might want government assistance, but it’s easy to see that there is absolutely no argument that they need government assistance. To get another perspective on whether a family earning $250,000 is struggling, it’s interesting to look at this US example of wealth inequality. Ignoring for a moment the monumental disgrace of the reality of the gap between rich and poor, I instead draw your attention to the ‘ideal’ amount of inequality. 92% of the 5,000 people surveyed in this research selected their ‘ideal’ inequality as the richest 20% being ten to twenty times richer than the poorest 20%. If this ideal was the reality, and I convert it back to Australian figures, a couple receiving a dole payment of $448.70 a week (who would fall into the poorest 20% of Australians), are receiving just 13% of what someone on $250,000 a year earns. In other words, families earning $250,000 a year earn eight to twenty times more than a family on the dole. So is Joel Fitzgibbon saying that the ideal top 20% of earners in our country are struggling? My question then for Fitzgibbon is – if our top 20% of earners are struggling, what words could we possibly use to describe the conditions of our lowest 20%? Here’s a suggestion: in desperate and immediate need of as much government assistance as the government can possibly afford. And if the government can afford to help these people more effectively by cancelling welfare for the very rich, then this should be done, and it should be done now. Fitzgibbon is below contempt when with that other pompus git McClelland who tried to harm Julia Gillard when he spoke on the amendment to the fairwork act. It was obvious to all watching that Fitzgibbon went around to him and patted him on the shoulder what these 2 creeps were up to, from my memory McClellands father was very ordinary politician also, Jim McClelland was a much better speaker and politician. I complained to my local member at the time and said that they are a disgrace to the party. If it is possible Fitzgibbon should be disendorsed for the safe seat of Hunter. I read you posts with interest & generally agree with the intent of much of what you post. So – thanks for a great contribution to the online discussion. I particularly agree with your comment that John Howard’s policy of providing welfare for the middle to upper income earners has created a toxic legacy of selfish entitlement which is feeding into the base political arguments of scaring people about refugees and many other areas of selfish prejudice. For 2 wage earners we’re pretty well off & I certainly don’t complain that I’m not entitled to child support or the Rudd family bonus during the GFC (although we have 3 dependent children). And when people ring to offer schemes to minimise my tax I tell them that I am happy to pay considerable tax to ensure good roads, hospitals & schools and a civil & safe society etc. However I write to put a slightly different perspective about superannuation tax incentives. These are not welfare. The Keating (St Paul) designed scheme meant that all contributions were taxed at the same level going in (15%). Some could describe this as equitable, however as we have a progressive taxation system others would argue that tax on super should also be progressive. But everyone (perhaps including you) who pays greater than a 15% marginal tax rate is receiving a concession – which is an incentive to put money into superannuation – thereby relieving future generations of the tax burden related to paying pensions for all retirees. So – providing me with an incentive to not be a burden in my retirement seems like a very sensible thing to do. This is an incentive, not welfare. And it will ensure that my money in my super fund will mean I will not get welfare when I retire! Sounds like a fair deal to me and society. If you wanted to maintain some incentives for super contributions, but make taxes on contributions progressive you could give everyone a 15% discount to their current marginal tax rate, so I would be paying 42-15, or 27% on my contributions. But would I put as much in? I’m not sure. The real rorts are around people using all the loopholes of family trusts etc to pay no tax now while also building a very large super nest egg. But as a wage earner, I pay my full share. So – lets not start lumping incentives to be frugal now & avoid being a welfare burden later with wasteful middle class handouts to be spent tomorrow on consumerist rubbish.